20 years experiences of Sodium sulfide making, sales and international trade. Frequent visiting to Australia, Singapore and some Southeast Asian countries for market researching, technology communication. A good job in expanding market share of Chinese sodium sulphide and inventing and developing soft package of sodium sulphide flake. Organized the first Chinese sodium sulfide market seminar on 7/28/1996, giving twice reports of "Marketing Situation and Tendency of Sodium Sulphide in China". This action has much good effection on stabling and increasing the competitivity of the price of sodium sulphide in world market. He is the organizer of WEST CHINA INTERNATIONALL SODIUM SULPHIDE INFORMATION NET-CENTER, the owner of "www.chinana2s.com. Its links are listed in YAHOO searching results on the first page, either Chinese or English. His experience was reported by many kinds of news paper such as the Inner Mongolia Daily, People Post, Worker Daily, Tianjin Evening, Nanjin Evening, and also by Inner Mongolia TV Station and Chinese Yahoo. 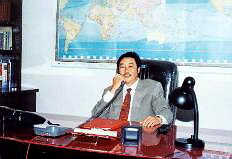 In 1999 he won the honor of The Advancers of E-Business and Net-Construction granted by Bayannor League of Inner Mongolia.